Ian Ogle (right) at an Ulster People's Forum press conference. 'Picture By: Arthur Allison /Pacemaker. The east Belfast UVF has issued a statement distancing itself from the murder of Ian Ogle. The 45-year-old father of two was brutally assaulted by a gang of people at the entrance to Cluan Place at around 9pm, with some of his attackers understood to be carrying knives. 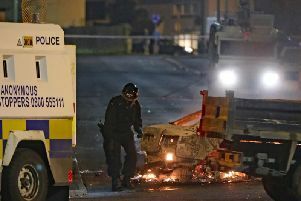 The well-known loyalist, who has acted as a spokesperson for his community in the past, was taken to hospital where he later died. Yesterday morning, a large cordon had been placed around the murder scene in Cluan Place and police were conducting searches of homes in the wider east Belfast area. In a statement issued to the Irish News using a recognised codeword, the east Belfast UVF said it “wholeheartedly condemned” those behind the killing of the 45-year-old. The PSNI, who were carrying out a series of searches yesterday, thanked the local community for their patience. Meanwhile, loyalist blogger Jamie Bryson has paid tribute to Mr Ogle and described his death as “barbaric and senseless”. Mr Bryson worked alongside Mr Ogle on the now defunct Ulster People’s Forum, which emerged in 2013 in the wake of the Union Flag protests in Belfast. He told the News Letter: “The murder of Ian Ogle served no cause. I would encourage anyone who has any information to take it to the PSNI and not be fearful of doing so. “I knew Ian personally for a number of years and thought highly of him. He was an immensely popular person within the community and it is a sad loss not only to his family but the wider community. Victims’ campaigner Willie Frazer, who also sat on the Ulster People’s Forum, praised Mr Ogle for his work in the community.